I had an idea of what i wanted and was really happy to see they had this set.. Bubble time... there is a Body milk and Body wash both smell like Oats, brown sugar and Almond... seriously nice! 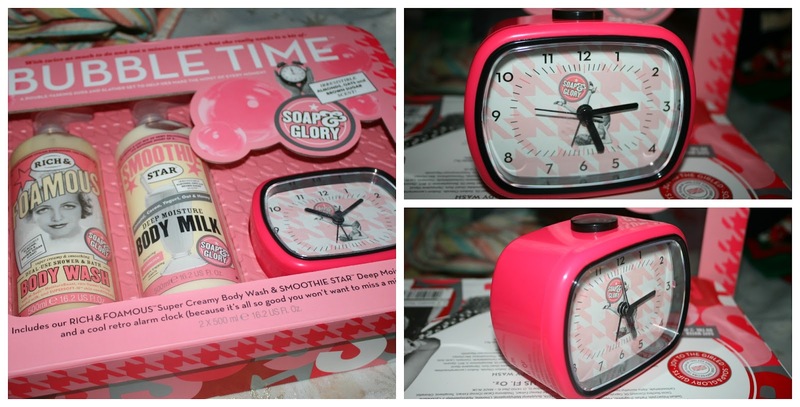 I was impressed to see that a battery for the clock was included in the set, well done Soap and Glory, nothing worse than getting present that has no batterys! Also this clock is really quiet no ticking to keep me awake at night which is good. It has a snooze button at the top, which also is a light so you can see the time when its dark... this gift set cost me £9 as it was 50% off. I did see a couple other gift sets which i liked, but i couldnt decide so i didnt bother wasting my money for the sake of it. I got this set for Christmas, I agree it actually smells amazing! The clock is good too, I have trouble sleeping so the fact it doesnt tick is a massive bonus! 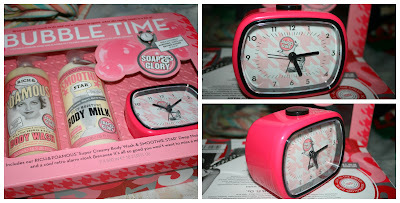 Love these items, the clock is lush.. i really need a non-noisy close as mine keeps me up all night!